Cahit Nakıboğlu, a 70-year-old businessman who spent nearly 1.5 years behind bars as part of the government’s post-coup crackdown against the Gulen movement, was re-arrested only a day after he was released under house arrest. 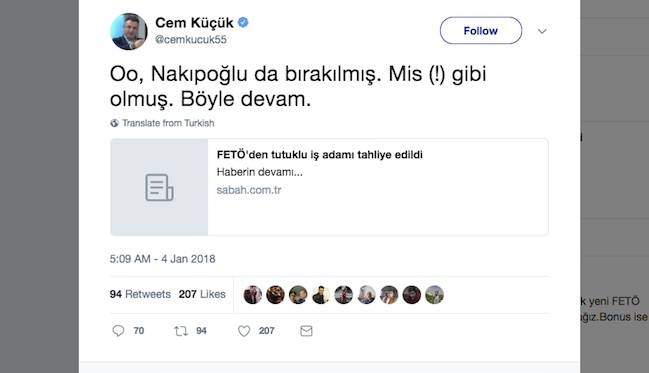 The new ruling to re-jail him came hours after the pro-government journalist Cem Kucuk criticized the initial court decision to conditionally release him. Nakıboğlu was first arrested on July 14, 2016 over his alleged ties to the Gulen movement which the government accuses of masterminding a failed coup in the summer of 2016. A Gaziantep court released him under a house arrest due to Nakıboğlu’s medical problems during a hearing on Jan 4. “Oh, Nakıboğlu was released as well. Good (!) decision. Continue like that,” Kucuk tweeted the same day. Nakıboğlu was jailed again on Jan 5, upon an objection to release by the prosecutor. At least 150,000 people have lost their jobs, 140,000 detained and 60,000 arrested over Gulen links since the coup attempt. Arrestees include businessmen, journalists, judges, prosecutors, police and military officers, academics, governors and even comedians.